CBS social viewing rooms and CNN Twitter - the future for social TV? I have previously written about ‘social TV’, highlighting live blogs around shows like the Apprentice and also the 2008 Ofcom Communications Market Report that discusses dual consumption of TV and online. However, this area is still evolving and recent US moves by CNN and CBS are developing this further. 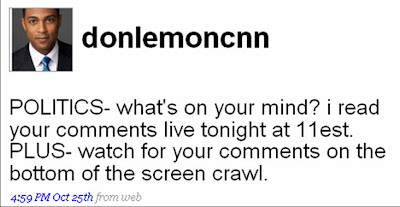 CNN are incorporating Twitter feedback into their news bulletins with CNN anchors / editors (such as Don Lemon) appealing for Twitter feedback after various news segments. 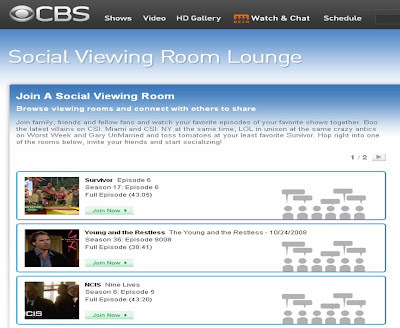 CBS are taking social TV to another level though by launching “social viewing rooms”, an online feature that allows groups of viewers to collectively watch and interact with streaming TV content at http://www.cbs.com/socialroom. This represents the growing trend of people connecting / sharing / consuming online in real time and seems to be the direction that social networks will also take in the future. It will no longer be enough to just ‘passively broadcast’ your content to your network, it will be about live socialising with two-way / multi-way congregation around content. Following this line of thought it is understandable why Facebook introduced Facebook Chat, why Friendfeed introduced discussion rooms and why Google moved into virtual worlds with the launch of Lively. All the major players are seeking to be the ‘hub’ for users’ internet experience (from iGoogle to Facebook) and I think we will see continual improvements in functionality with aggressive, regular iterations of existing platforms, pulling more and more content into a central place with increasing virtualness around it. If CBS’ “social viewing rooms” are successful then I think others will follow – and if users host them inside their social network profiles, then it could really change the way that certain demographics consume TV content in the future. It won't just be watching TV whilst surfing the internet, it will be consuming (and discussing) TV content with friends inside a personal online space. Somewhere, somebody is working on a social platform that will become the standard, or at least the new paradigm. Facebook, Twitter, etc. are playing an important role in changing how we engage, consume and interact, but I think they are just the early pioneers.